The following is a video taken from September 24, 2009, at the Goodwill Industries of Kansas Annual Banquet. Please enjoy! 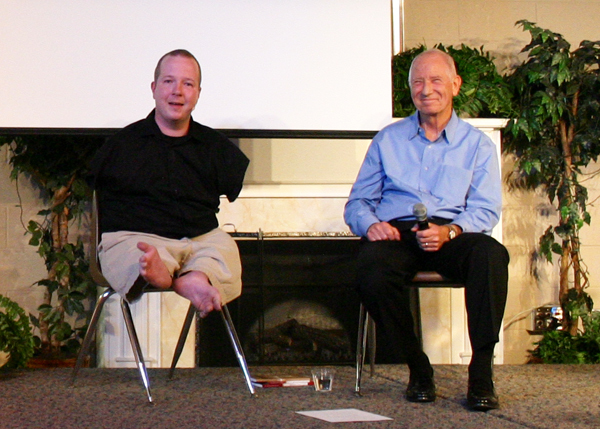 This past weekend, my dad and I journeyed out to speak four times at three different locations in two different states. We first arrived on Thursday night in Wichita, KS, were I spoke to Goodwill Easter Seals of Kansas. Goodwill was celebrating the year with an awards banquet, and we watched as so many employees were rewarded for their hard work. We also heard some of the best “acceptance speeches” ever. One young lady simply walked up to the microphone after receiving her award and announced, “Woohoo!” I think the Academy Awards recipients in Hollywood need to take a cue from these Goodwill employees. It was a fantastic night, and I was so glad to get to tell my story and inspire those serving the community in Wichita, KS. Next, on Friday, we boarded the plane headed for Sacramento, CA (after a stop back in DFW…gotta love the routing of the airlines). After landing, we drove to Stockton, CA, where we both were to speak for Stockton Pregnancy Healthcare. Their annual banquet was held at an area country club, and the dinner was “luau” themed. After eating some great food, my dad and I told our story. We had a great crowd and they were very attentive despite a loud party going on in the room next to ours. I was so impressed by what Stockton PHC has been able to do with very little financial support, and we hope that those at the banquet that evening were able to help continue the pro-life cause in Stockton, CA, with their donations. We took Saturday to drive to San Francisco to see “Wicked.” Such an awesome show, and what a great lesson to learn about not judging others by the color of their skin. Finally, on Sunday, we spoke twice at Quail Lakes Baptist Church in Stockton. This church was rockin’, and they were so welcoming to us. I was so impressed by the multitude of races represented in their membership. I firmly believe that God intends for our churches to reflect the racial makeup of the world around us, and it was so refreshing to see people from so many different backgrounds worshiping together. Quail Lakes Baptist and Pastor Marc are to be commended for not excluding anyone from the message of the Gospel. In closing…I LOVE my job as an inspirational speaker!!! I was glad to get home to my family, but even though it was tough being away from home, I absolutely loved the ability to simply tell my story and for others to be touched by it. Praise God for the amazing things He is doing right before our eyes!